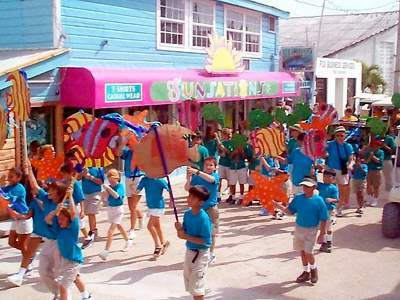 San Pedro celebrates Belize's 20th Birthday! "Long live Belize! Que Viva Belice!" were the words shouted by His Lordship Mayor Alberto Nuñez as he welcomed Belize's 20th Independent Birthday. Hundreds of Belizeans and visitors joined in celebrating Belize's independence at the well-organized ceremony that took place at Central Park on September 20th. The celebrations began early evening as Barrier Reef Drive was closed to vehicular traffic and was transformed into a block party which many said resembled "La Calle Ocho" in Miami. The block party extended from the front of Spindrift Hotel all the way to Fido's Courtyard. The street was filled with a variety of establishments who came out to "camp" by setting up booths on the street, providing much festive music, party favors and "spirits" to the multitude of people who chose to celebrate. Others like Caliente Restaurant were serving some of their mouthwatering dishes and house special drinks. Also present at the block party were Barefoot Iguana Disco, Juvinie's Bar, Jaguar's Nightclub, Fantasy World and Mr. C's Sports Bar. The block party was a first for San Pedro and certainly lived up to the expectations of all those present who partied until the wee hours of the morning. Minutes before midnight, the partying was partially interrupted to give way to the official ceremonies. Leading up to this part of the program were the talented dancers of Barbara's Dance Group. The San Pedro Dance Company then paraded patriotically down Barrier Reef Drive and into Central Park. Students of St. Peter's Elementary then entered the park displaying the traditional 21 torches, followed by members of the Belize Defense Force (BDF). On stage, Mayor Alberto Nuñez was accompanied by the San Pedro Town Councilors, the Area Representative, reigning Miss San Pedro Adaly Guerrero and queen-elect Dilcia Trejo. Justices of the Peace were honored with special seating during the ceremony. Mayor Nuñez and the Area Representative then performed an official inspection of the gallant members of the BDF unit before addressing the gathering. Mayor Nuñez then welcomed Belize's Independence, which was greeted by a spectacular fireworks display. 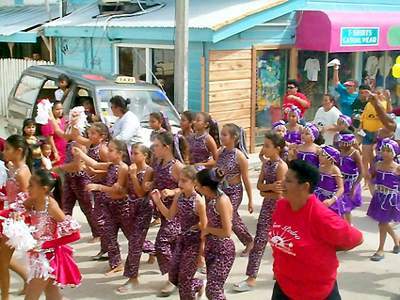 Independence Day brought many Belizeans and visitors together to celebrate. The San Pedro Lions Club offered barbecue for sale to the crowd who eagerly awaited the official coronation of Miss San Pedro. Once again, Central Park was filled to capacity to witness this part of the celebrations. Miss Dilcia Trejo wowed the audience as she stepped on stage to accept the scepter, crown and cape. 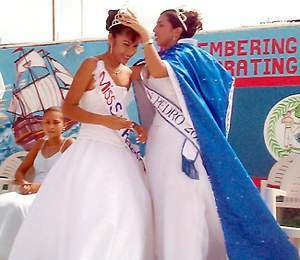 In her acceptance speech, Miss Trejo pledged to promote San Pedro as a tourist destination to the best of her ability. Wearing a spectacular white gown, Miss San Pedro 2001-2002, in all her majesty, led the way for the citizens' parade. Joining the parade were the Belize Bank Team, Island Academy, Isla Bonita Elementary School, San Pedro Dance Company, Salvadoran Brothers in Arms, Jose "Spanish" Pacifico, Little Angel's Pre-School and many others. The fun continued with an afternoon "jump-up" and games including the ever-popular greasy pole. As evening approached, many took time for a little rest before the Byron Lee concert at the old football field. 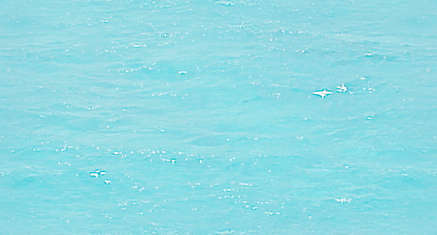 This Reef Radio Production was the perfect way to culminate the celebrations. The San Pedro Sun applauds the efforts and good planning of the San Pedro Town Council, especially the hard work of Deputy Mayoress Mel Spain and Councilors Domingo Perez and Omar Arceo. A big thumbs up to all participants!